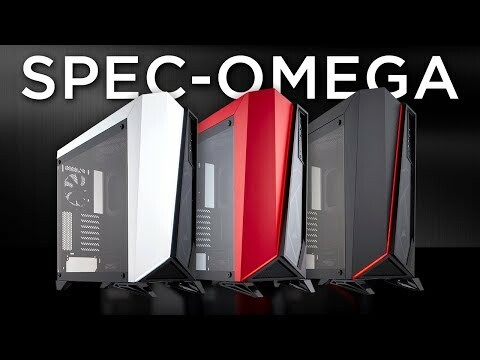 The Ultimate SPEC Chassis from CorsairThe Carbide Series SPEC-OMEGA in Black is a mid-tower PC case with eye-catching angular looks, integrated red LED lighting, and unique tempered glass front and side panels that show off your system in style. With the Direct Airflow Path design and 2x CORSAIR SP120L fans included, together they provide abundant air flow to your components be assured that your system will stay cool. Upgrade your cooling with room for up to a 360mm liquid cooling radiator in the front and up to six fan mounts. With an internal layout designed to make your build striking inside and out, you’ll find a variety of cable tie-downs, routing holes and grommets. The Carbide Series are built to show off your system and turn heads, this is the ultimate SPEC. Stunning System Display The Carbide SPEC-OMEGA in Black allows you to display your system unlike any other case, with tempered glass side and front panels there’s no need to hide your system. Stand out from the rest If you’re looking for a unique design that will always stand out, the SPEC-OMEGA in Black from CORSAIR is the PC case for you. The asymmetrical, angular design gives the case a bold and distinctive look. Featuring an integrated front-panel red LED light strip and 2x red LED-lit 120mm cooling fans, that adds bright illumination and further dramatic styling. 2x efficient SP120 fans Keep your system completely cool inside and out, with two CORSAIR SP120 fans included, positioned to deliver efficient airflow to your hottest components. Tidy away your cablesWith your system on display, SPEC-OMEGA makes it easy to keep your cable routing neat, tidy, and out of the airflow path for improved cooling. Quick and easy upgrades You can smoothly upgrade to the ultimate power of liquid cooling for your CPU or GPU with up to a 360mm Hydro Series cooler.